When choosing a performance road bike, you need to make concessions. You can choose stiffness or compliance, not both! Deliberate over an aerodynamic or lightweight frameset, always wondering if you’re making the right choice. Then, what if you fancy an adventure? Neither of those options is going to be ideal. Before you know it, your head is in a spin, weighing up the pros and cons. Well, now you can ditch the dilemma and have it all with the new Specialized Roubaix. Lighter than the Venge, as aerodynamic than the Tarmac SL6, and boasting a revolutionary new suspension system; the new Roubaix has torn up the rule book. This is the choice for riders who’d rather follow their nose than follow the pack, it’s a road bike ready for whatever you throw at it, and it’s the most technically advanced road bike Specialized has ever produced. First conceived to conquer the infamously brutal cobbles of the Paris-Roubaix Spring Classic, the Specialized Roubaix succeeded in a record sixth win at the Hell of the North in 2018. If it’s the fastest bike over those dreaded Pavé sections, what chance do your local potholes have? Add the benefit of improved aerodynamics and this bike rolls 14 seconds faster over 40km than its predecessor. There’s even clearance for 33mm tyres, blowing open a host of mixed surface possibilities. If you think suspension only exists to make off-road journeys more bearable, then why does a Formula 1 racing car have some of the most advanced systems in the world? Racing exclusively on super-smooth tarmac, these precisely engineered machines can corner harder, gain more traction and race faster thanks to the protection from vibrations offered by their suspension. And if you’re thinking "that type of thing has no place on a road bike", did you think that way about disc brakes at first too? In the final stages of the 2018 Paris Roubaix men’s road race, Peter Sagan famously tightened the stem of his Specialized Roubaix with a multi-tool. Eagle-eyed viewers will have noticed that his Future Shock front suspension system looked different to those already on the market. That’s because he was riding a prototype of Future Shock 2.0. Perhaps, as claimed, his stem had come loose, or perhaps he felt the need to draw the camera’s attention to the unfair advantage he had over Silvan Dillier in the breakaway, who he outsprinted in the Roubaix velodrome. Future Shock 2.0 simultaneously controls compression and rebound damping through a hydraulic damper with 20mm of travel. In other words, it’s proper suspension. On-the-fly adjustments can be made to the damping resistance by turning the dial on the top cap. Stiffen it up for climbing out of the saddle or out-sprinting Dillier in the velodrome, then loosen it when rolling over choppy terrain to help keep your speed up. 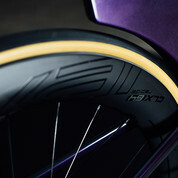 The Roubaix Comp and Sport models come with Future Shock 1.5; an improvement on the first generation of suspension, with better top-out and bottom-out behaviour, smoother action at the top and bottom of the stroke, and it’s quieter when unloaded. Both Future Shock systems have a new Smooth Boot, which integrates the headset with a clean, uncrumpled aesthetic. To balance the supple feel of the bike under the rider, it’s paramount to match front and rear end compliance. 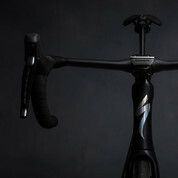 Specialized has created the first ever aerodynamic seat post with built-in compliance. While the previous CG-R, or Cobble Gobbler, seat post did a fine job of damping vibrations, its looks were somewhat polarising. In the new S-Works Pavé seat post, Specialized has incorporated the same flex within the carbon layup, leaving a beautifully streamlined seat post with the same D-shape design found in the Tarmac. By bolting the seat post further down inside the frame, more of the post is free to deflect, maximising compliance. This S-Works seat post comes as standard across the whole range, ensuring comfort equality to backsides of all budgets. "The Pavé seat post for me is the star of the show - Really, really good - You can stay completely seated on the cobbles and get on top of that important big gear." - Dan Braid, Sigma Sports Workshop Production Manager. By putting all of the compliant elements of the Roubaix underneath the rider but above the bike, you get a seriously stiff frameset that transfers power at the sniff of an extra watt. The FACT carbon fibre layup keeps the bike rigid and responsive, while the suspension systems keep the bike’s engine (you!) comfortable and capable of maximum output. So, you can forget the stiffness vs compliance dilemma completely. There are no women’s models of the new Roubaix. And no men’s models either. Through their extensive research, collating thousands of Retul fit data results, Specialized discovered that there is a greater difference between two men than between a man and a woman. And so they created the Roubaix with geometry to suit everyone. Rider-First Engineering ensures the same handling qualities across all sizes, too. The S-Works Roubaix frame weighs just 900 grams (claimed) in a size 56cm, making it a seriously lightweight road bike that can mix it with specialist climbing bikes. The computer-designed FreeFoil tube shapes take cues from the extremely aerodynamic Specialized Venge, and were validated in the Win Tunnel for their wind-cheating abilities. First and foremost, this is clearly a performance road bike; you don’t win Paris-Roubaix six times on a one-trick-pony. The innovative compliance details are an added bonus that throws the bike into a world of versatility that its competitors can’t get close to. In the lightweight vs aerodynamic vs compliant Venn diagram, the new Roubaix sits firmly in the middle. Sigma Sports Workshop Production Manager, Dan Braid, got his hands on the new Specialized S-Works Roubaix and took it to the perfect testing ground, Secteur pavé de Tilloy-lez-Marchiennes à Sars-et-Rosières, and of course the Roubaix Velodrome. 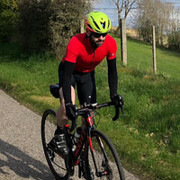 About Niall Gaffney : Cycling became more than a method of getting from A to B for Niall when he bought his first road bike about ten years ago. Since then, he's covered thousands of miles in the Surrey countryside and over the water in his native County Dublin.